Kubbeh, a stuffed dumpling, is a common food in the Middle East and is especially popular in the Nazarene cuisine. 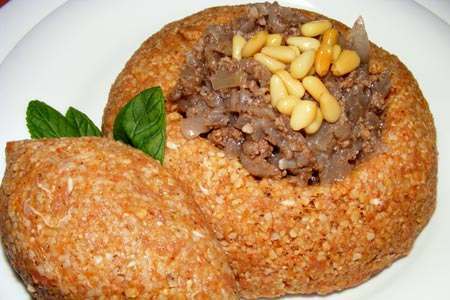 A popular Nazarene Kubbeh is made of shredded wheat turned into Bulgur during a special process, and mixed with fresh minced lamb meat. *Please feel free to browse Elbabour 's site for culinary inspiration and different recipe ideas. Other than being a favorite Nazarene food, the Kubbeh has become a symbol in the Galilean-Nazarene culture. For example, in cold winter days, especially at New Year the Nazarene Christians love eating the Kubbeh accompanied by a glass of Arak. They throw Kubbeh balls at the wall, to indicate the end of the former year and the beginning of the new one. Were you to wander around in Nazareth years ago, on new year`s eve, you wouldn`t be able to ignore the sound of Kubbeh meat being pounded in a special stone bowl. This was a chore reserved for the matriarch, during which pieces of meat would fly to the ceiling, and sticking to it. This image, composed of sounds and meat fragrance and spiced with much nostalgia, is the reason why Elbabour created spices especially for the Nazarene Kubbeh dish. The leading spices added to our Kubbeh are pepper, nutmeg, cumin, red paprika, marjoram and onion. If you happen to be familiar with the Nazarene cuisine or have already become acquainted with it`s wonders through our site, you must already know that a successful Kubbeh dish can`t be achieved without suitable spices. Come visit us, and we will be glad to assist you in choosing the right spices for your very own delicious Kubbeh dish.